​Find your personality among our wide selection of shade sail fabrics, each designed to complete your special look. Whether replacing worn fabrics or creating your own shade with our vibrant colors, we have the vision to help you succeed. Available in a wide spectrum of hues and looks, your personalized shade sail fabric will sure to please for years to come. Here are our most popular shade sail fabric colors. Most commonly used shade sail shapes and sizes. 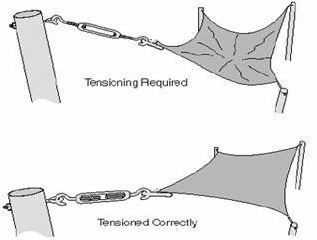 If installing yourself, please be sure proper tension is equally applied. We recommend using us to install all your shade sail fabric and hardware to avoid possible damage and incorrect installation.